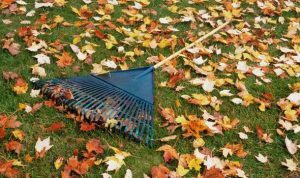 Autumn lawn maintenance – Although Autumn is often cold, damp and miserable it is also the most important season in the world of lawn care. The days get cooler and shorter, but it is the perfect opportunity to overseed and prepare your lawn for the following season. Lawn moss is a very common problem for most gardeners. It can be caused by many different factors such as drought or even waterlogging. You can get rid of the moss by either using a spring-time grass rake on smaller lawns or a mechanical scarifier on larger lawns, however, please be careful when scarifying your lawn as this method can cause damage to your lawn. A tip for scarifying – On the first pass – go gently back and forth in the same direction covering your entire lawn area. Quickly clean up any debris ready for the second pass of the scarifier, on the second pass – adjust your pass direction from the previous pass by a few degrees. This will give you the best results and help minimise any damage that may be caused by scarifying your lawn. You may have to carry out these steps several times to complete this task, after the completion of the scarifying process you may want to water and fertilise your lawn or even reseed any bare or thinning patches of lawn. Clean up any debris from the lawn and you have finished, time for a well-earned cup of tea. Using a rake which is especially made for use on lawns, tidy your lawn by raking the surface of any leaves or debris. This will help to prevent waterlogging and yellowing from lack of sunlight. You could also use a leaf blower if one is available, this could be the easier option if you have trouble around the garden. To help water penetrate into the soil and improve drainage, aerate your lawn. 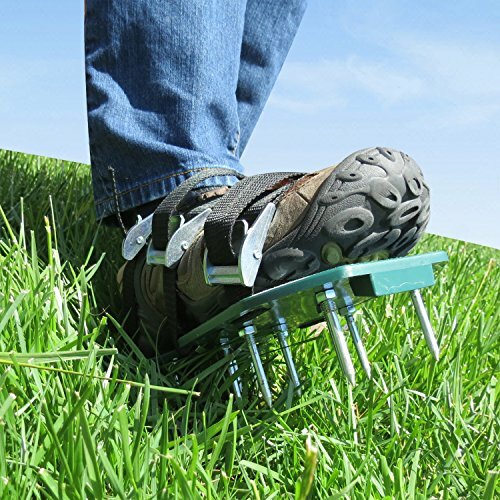 Lawn Spike Aerator Shoes are a great option, not only does your lawn get a workout but so do you! This process pierces the ground with small holes allowing air, water and vital nutrients access to the grass roots. Autumn is a great time to aerate your lawn because the grass is still growing and the weather is not too dry. Use an autumn feed which is low in nitrogen and high in potash to help strengthen your grass, toughening it up ready for the winter months ahead. It can be applied any time from September to mid-November when the weather is fair, the soil is moist and the grass is dry and frost-free. Although most spreader packs can cover 100 square metres, if you have a large lawn, you may want to purchase a large bag and use a spreader to make application quick and easy. As the winter period draws in, so does the amount of sunlight. For this reason, it is vital that the lawn gets as much of this sunlight as possible so grab for your grass rake and rid your lawn of any leaves and debris that might be blocking that valuable sunlight.